Image Size: 28 X 37.25 in. Each and every piece of art is hand highlighted, signed and dedicated on the back of the art by Michael Godard. Very Limited quantities so this will not last long! 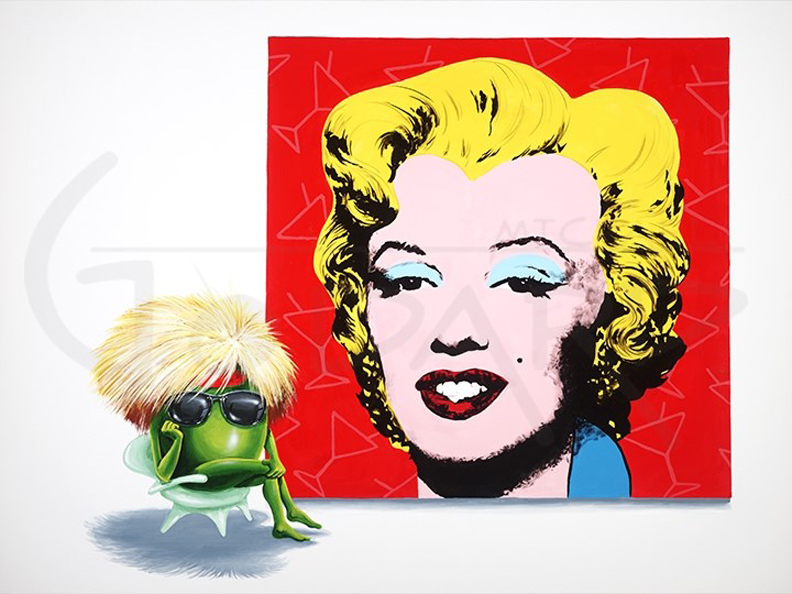 In this tribute to Andy Warhol, he sits with one of his most iconic paintings, his portrait of Marilyn Monroe. The classic pose is taken from a well-known photograph, where behind him his silk-screened flowers fill the room. In my interpretation, for the chair, I wanted something retro to convey the furniture of the 60's in a mint green, while subtly in the background of the Marilyn painting are faint martini glass silhouettes. This is the beginning of a series of Warhol paintings which I plan to pay homage to my favorite artist.